Robert Hockaday, President of Tucumcari Bio-Energy and Energy Related Devices, Inc. addresses the audience at the ceremony. Mesalands Community College recently held a spring formal induction ceremony for students in the Beta Eta Omega Chapter of the Phi Theta Kappa (PTK) International Honor Society. PTK is based on academic achievement and offers personal development through scholarship, service, fellowship, and leadership. Each candidate for membership in PTK, must have completed 12 credit hours, which leads to a declared major, with a grade point average (GPA) of a 3.5 on a 4.0 scale, currently enrolled in six credit hours, and adhere to the school code. A cumulative GPA of 3.25 must be maintained to remain in good standing. 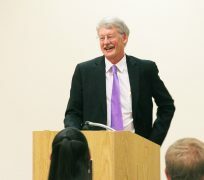 Robert Hockaday, President of Tucumcari Bio-Energy and Energy Related Devices, Inc. was the guest speaker at the event. During his speech, Hockaday gave science-related examples on how small changes can make a major impact. He talked about how bubble wrap was accidently developed in 1957. This small invention changed the shipping industry and is now transforming renewable energy practices. Hockaday explained how he uses sunlight and bubble wrap, to keep three million gallons of organisms warm. These organisms process 32,000 tons of cattle manure per year, that is used for carbon dioxide, methane, and organic fertilizer. “Ultimately, securing our water supply, food supply, stabilizing the earth’s temperature and reducing our dependence on fossil fuels, is necessary just to keep us, and our world stable,” Hockaday said. The Phi Theta Kappa Spring 2019 inductees: (l to r) Jasmine Hernandez, Ryan Price, Cambry Dudley-Lujan, Tyler Fanska, Tamara Claudio, Tony Ponce, Cassy Leodolff, and Frank Beltran (not in photo).